This is an extended version of the original Core article. In the print version of the Core, these photographs ran without attribution. The editors regret the oversight. —Ed. An odd decision, given how turbulent 1968–69 had already been. In October, students held a “tent-in” on the quad to protest the lack of adequate housing. In November, 100 students demonstrated outside the inauguration of University president Edward Levi; inside at the formal dinner, protesters repeatedly interrupted the speakers, while guests retaliated by kicking the protesters or dousing them with glasses of water. 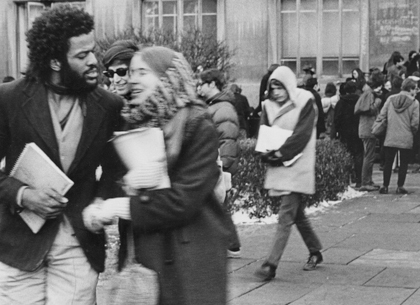 Initially, Dixon kept her silence, but soon enough gave a talk at the Blue Gargoyle and an interview to the Maroon, headlined “Marlene Dixon Speaks Out Her Truth”: “I increasingly realized that I couldn’t stop being a radical in the classroom, and that furthermore I didn’t believe in value-free sociology,” she said. While much of the debate about Dixon was serious, if impassioned, pranksterism came into it too. 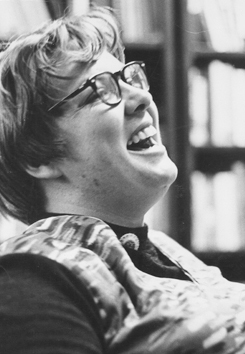 One afternoon, eight women from the student group WITCH (Women’s International Terror Conspiracy from Hell) burst into the sociology tea room and put a hex on sociology chair Morris Janowitz: “Beware of the curse, the witch’s curse, Morris Janowitz of sociology, a hex upon thy strategy,” they chanted. “Women enraged with this denial come in black to demand a trial, not of Mrs. Dixon but of yourself: such arrogance from such an elf.” Unfortunately for the WITCHes, Janowitz was not there. They tried cursing him near a room where he was scheduled to teach, but he wasn’t there either. 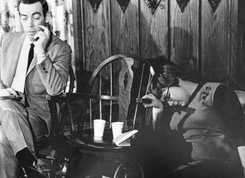 Meanwhile, not to lose sight of the national scene, the U of C group Students for Violent Non-Action called for every possible toilet in America to be flushed when President Richard Nixon delivered the final word of his inaugural oath on January 20. As January wore on, cold and snowy, the debate grew more and more heated. 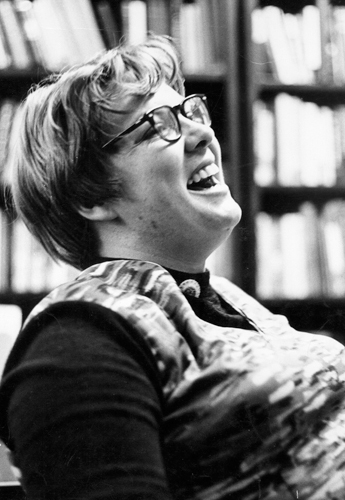 A faculty committee, chaired by then-associate professor of history Hanna Gray (later president of the University) was appointed to investigate the Dixon decision. Its seven members included two other women: Helen H. Perlman from the School of Social Service Administration and Susanne Rudolph from political science. D. Gale Johnson, dean of the graduate Social Sciences Division, told the Maroon that he had specifically requested so many women members. But that did not appease Dixon’s supporters. 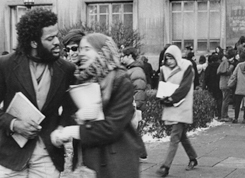 “How can an unbiased judgment be expected from a committee formed from a University which claims to be a bastion of pure, value-free, uncorrupted, ivory tower thought, yet which allies itself with the war machine and acts as an agent of social repression to the black ghetto?” Steve Rothkrug, X’70, wrote in the Maroon. Sociology faculty agreed to a meeting to discuss hiring in general but walked out when students demanded to discuss Dixon specifically. The following week, 150 students broke into Johnson’s locked office at lunchtime. For two hours, Johnson sat in his chair and coolly answered questions, though “I didn’t get much chance to speak after the first hour,” he told the Maroon. 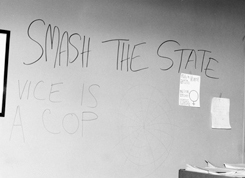 In the outer office, Janowitz argued with protesters while standing on a table. 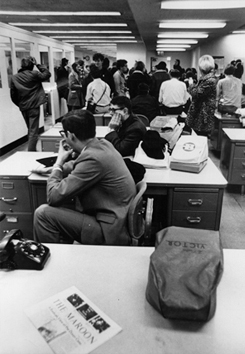 At noon the following day, the protesters, now renamed the Committee of 444, entered the building. But according to Martin Northway, X’70, they nearly didn’t. Disapproving of the protesters’ tactics—and worried that student-aid checks would not be available if the bursar’s office were closed—football player Northway and about 20 other athletes stood shoulder to shoulder in front of the doors, blocking the protesters from entering. “We didn’t threaten anybody, we didn’t look ferocious, we were just standing there,” Northway says. Two or three times, he says, the protesters tried to lead a surge into the building and were quietly repelled. The administration was ready. 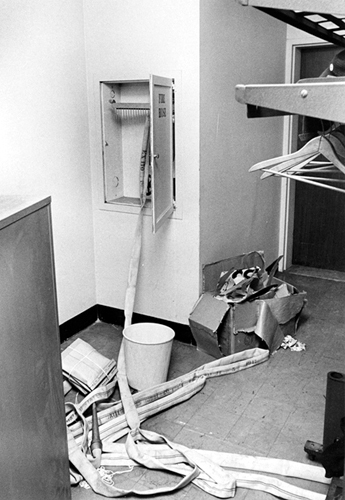 Private offices were locked, and all phones in the building were shut off, including the pay phones. One employee in the public-information office left a sign reading, “Sit-inners: Water my plants if you’re here Friday. They’ve already been watered Thursday.” At 12:30, Charles O’Connell, AM’47, dean of students, gave the protesters a disciplinary warning and a deadline of ten minutes to leave. When the deadline came and went, a group of administrators passed out summonses to appear before a disciplinary committee. At least one student burned the summons. The students were ready too. They brought in large stores of food, and “most of the students were dressed in jeans and other casual clothes,” the Maroon noted, “as if ready for a long stay.” About a dozen student marshals, wearing white armbands, circulated throughout the building to keep order. “The University’s reaction was a very sane one. They just ignored us,” says Jeff Maso, X’69, who was on building security. “They regarded us like the flu: in a couple of weeks, this will go away, and we’ll all feel better.” Meanwhile the Maroon returned to its old format and started publishing daily. 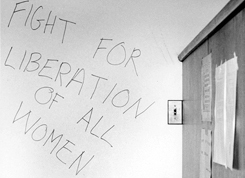 Discipline cracked down quickly, in the very earliest days of the sit-in. On February 3, a disciplinary committee chaired by Dallin H. Oaks, professor at the Law School, temporarily suspended 61 students for participating in a “disruptive demonstration” until the charges could be resolved. “The sticky wicket for me,” says David Bevington, professor of English, “was that somebody had to identify students. 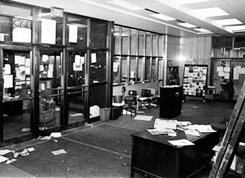 I was in and out of the Administration Building all the time, and I was not about to do this.” In two previous sit-ins of the Admin Building, in 1966 and 1967, demonstrators had willingly given their names. 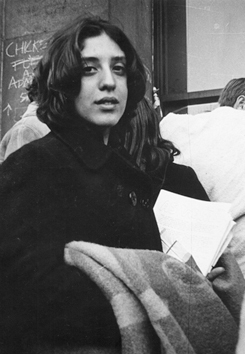 (Both were protests against the University’s policy of releasing the academic records of male students to their draft boards.) But during the 1969 sit-in, protesters did not cooperate. “You have to remember that anyone who lost their student status, their 2-F, was subject to the draft,” Fox says. “I wasn’t doing anything that was beyond the bounds of annoyance. No one could be kicked out for being an annoyance.” At that, the group definitely succeeded: “If you had thought for days and nights for the best way for nothing to be done, you couldn’t have come up with anything better than the Chickenshits,” Wayne Booth, AM’47, PhD’50, dean of the College, told the Maroon at the time. 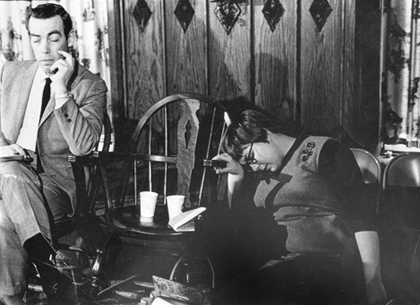 As the sit-in began its second week, criticism increased. On February 7, a group of 300 students held a rally against it. 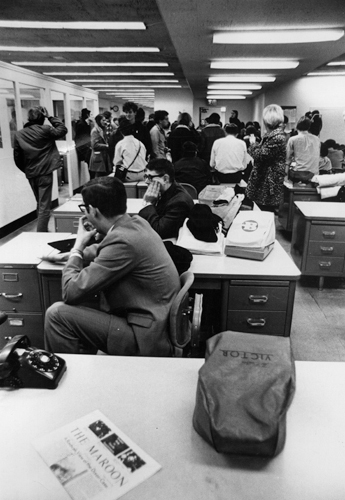 And a formal survey of students—printed in the Maroon, but copyrighted by its authors, William Ouchi and Ellen Fried—showed that a majority opposed the sit-in, though they also supported amnesty for the protesters. But for Sinaiko, that comparison is inaccurate. As the sit-in began to lose momentum, Sinaiko attended an open meeting at the Oriental Institute, where the protesters were discussing strategy. Someone at the meeting—“clearly one of the more radical types,” he recalled—argued they should take over the library’s rare-book room and burn one book an hour until the University met their demands. On Feburary 12, the Gray committee announced its decision. Dixon was offered a one-year contract in human development, which she promptly declined. 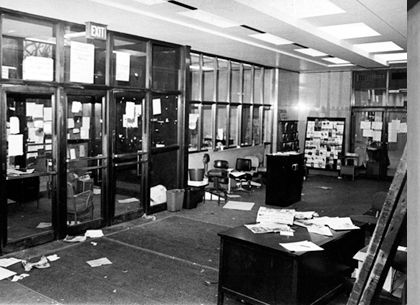 With no cause left to fight, the protesters left the Admin Building on February 14. Now the focus of the students’ dissatisfaction shifted to the disciplinary committee. On February 24, 100 students gathered at Levi’s house with a petition demanding that the committee accept a collective defense. As Maso recalled, the group’s plan was to nail the demands on the door in imitation of Martin Luther. They pounded on doors and windows until a female student managed to kick in a window. 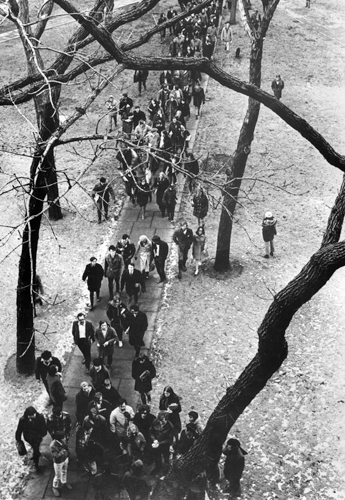 When campus police dispersed the crowd, 70 students marched to the Quad Club, where Maso, who worked there as a junior bartender, let them in. After half an hour, the protesters voted to leave—after taking up a collection for the wait staff. Dean of Students Charles O’Connell, AM’47, told the Maroon the protest was “the most mindless, the most senseless, and the most child-like behavior” he had ever seen on campus. The demonstration resulted in nothing but an additional disciplinary committee—this one chaired by Charles Shireman of the School of Social Service Administration. As winter turned to spring, the suspensions and expulsions began to mount. By April 1, the Maroon reported, of the 164 students summoned before the two disciplinary committees, 62 had been suspended and 37 expelled. Like the sit-in, the discipline that was meted out exposed generational divisions within the faculty. A group of 64 professors—including Paul Sally of mathematics, Ralph Austen of history, and Janel Mueller of English—signed a petition demanding no disciplinary action until a committee had been appointed that adhered to the guidelines of the American Association of University Professors. These guidelines required that committees should include students—not just as observers—and that violations had to be published in advance in a student handbook. 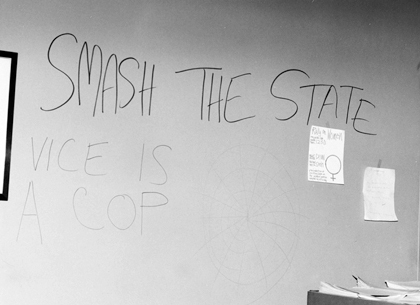 On April 9 and 10, protest leaders, now calling themselves the Committee of 500, organized a strike of classes at Cobb Hall, described by the Maroon as “about 70 percent effective.” At noon on April 9, there were fewer than 100 students in the building. Sympathetic professors either canceled their classes or held them elsewhere. The faculty also held demonstrations: an hour-long, silent vigil outside the Admin Building on April 14 and another outside the Quad Club on May 6. Sally and two other faculty members appeared before the Council of the Senate to argue the disciplined students’ case, to no avail. On Tuesday, April 15, seven students moved into tents on the quads, and over the next few days—despite thunderstorms and leaky tents—the number grew to 14. The strikers had agreed to consume only orange juice, water, and vitamins; one student chose to drink only water. “It was probably the most theatrical thing I ever did,” Leighton says. For many of the administrators at the center of the dispute, the sight of young people going hungry was too much. “I wish to gosh they’d eat something,” Edward Rosenheim, professor of English and spokesman for the Committee of the Council, told the Maroon. Dean O’Connell had a similarly fatherly reaction. During a Maroon interview while it was thundering outside, he “repeatedly peered out his window…and expressed concern for the health of the strikers.” He said he had thought about asking his wife to bring the strikers bowls of chicken soup but had decided against it. The following day, Dean Booth stopped by to talk. 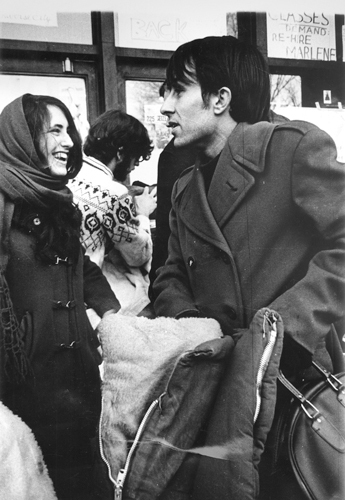 “He spoke with us so sympathetically,” hunger striker Susan (then Loth) Wolkerstorfer told the Maroon, “and then when he left he said, ‘Well, if there’s anything I can do for you short of giving you want you want, let me know.’” After nine days of fasting, the discouraged strikers gave up. 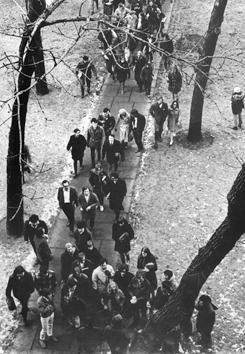 As a result of the student unrest in 1968–69, the administration made some small changes to give students a stronger voice in University policy making. There is now a student ombudsman, and student evaluations are taken into consideration in tenure decisions. (Students with political concerns beyond the campus continue to struggle to have their concerns heard: in recent years, protests against investment in Sudan and against selling Coca-Cola on campus have failed. 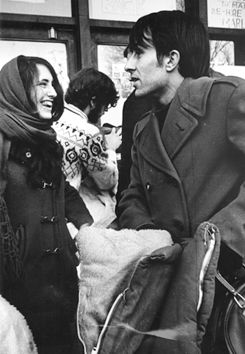 As a Maroon headline in the 2009 Orientation issue put it: “Campus controversies: the debates students will lose this year.”) In perhaps the biggest change to undergraduate life after 1968–69—“You’re kidding,” says Maso, when first informed 40 years after the fact—varsity football returned the following fall. Courtesy of Chicago Maroon. 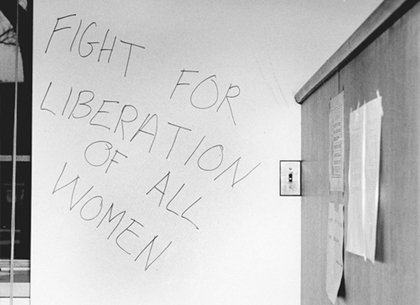 Photographer: David Travis, AB’70. 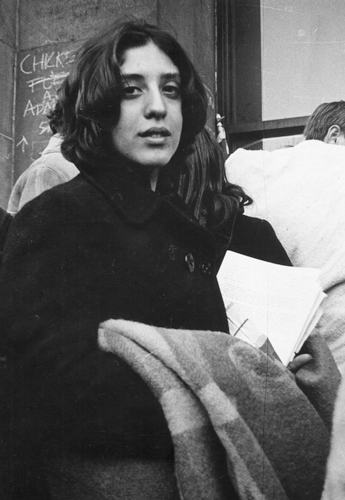 Marlene Dixon, whose dismissal sparked the sit-in. Courtesy of Chicago Maroon. Photographer unknown. Protestors inside the Administration Building. Courtesy of Chicago Maroon. 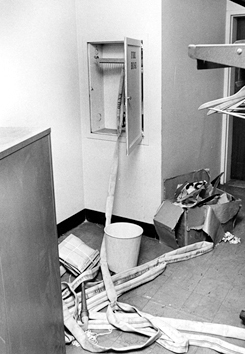 Photographer: David Travis, AB’70. Graffiti at the Administration Building. Courtesy of Special Collections. Photographer unknown. Damage to the Administration Building. Courtesy of Special Collections. Photographer unknown. Graffiti and other property damage to the building’s interior. Courtesy of Special Collections. Photorapher unknown. The strain wears on Dixon. Courtesy of Chicago Maroon. Photographer unknown. Courtesy of Chicago Maroon. Photographer: Steven Aoki, AB'72, SM'73, PhD'79.